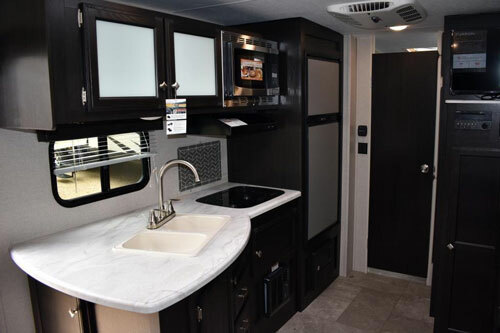 Venture’s Sonic SN220VRB is an ultra-lite travel trailer, modern construction materials and techniques, attractive floor-plan and features makes it ideal for RV-ers. On the landscape of industry of recreational vehicles, the Venture RV seems to be relatively little-known company. Parented by the K-Z (famous manufacturer of truck campers, itself subsidiary of the giant – Thor Industry), since years the Venture RV offers series of lightweight trailers SportTrek, Stratus and Sonic. Of those, for this presentation we selected the series of ultra-lite travel trailers Sonic. While this series also includes the line of Sonic Lite trailers with weights (UVW) ranging from 2,500 lbs to 3,400 lbs and GVWR limited to 4,000 lbs and specifically designed for towing by smaller vehicles, for the reasons explained below, we decided to pick a larger Sonic model. 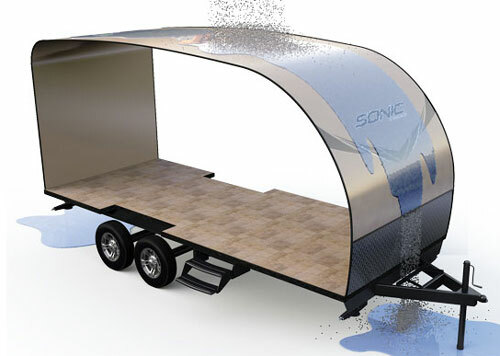 All models of Sonic and Sonic Lite travel trailers are designed as ultra-lite RVs (similar design, construction materials and techniques etc…). In fact, for all Sonic and Sonic Lite trailers, the ratio of UVW (weight) per linear feet of trailer’s length comes very close. So, both families of trailers belong to the same category of ultra-lite RVs. 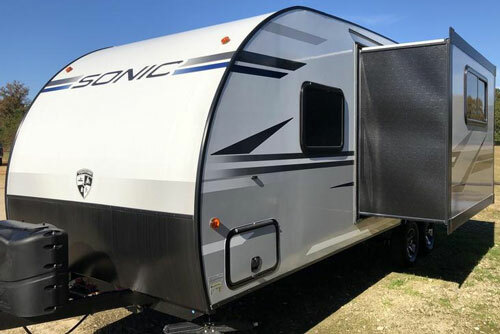 Basically, the main difference between Sonic and Sonic-Lite models is the length of trailers and coming with it living space, features and amenities. The length of Sonic Lite trailers ranges from 19’2” to 22’, while Sonic trailers cover the range from 22’6” to 26’11”. The only other dissimilarity of Sonic Lite trailers is their single axle compared to Sonic’s tandem-one. At the end, our selection of the model Sonic SN220VRB was determined by several of its characteristics. 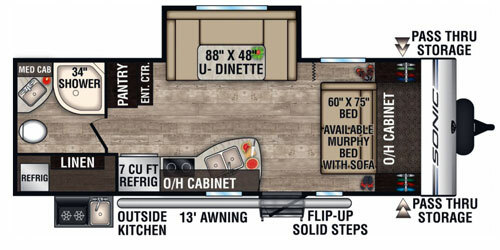 These include ample living space, well-thought design, much sought and widely appreciated features promising comfortable RV-ing as well as enclosed underbelly and tandem axle (for easy towing and maneuverability). NXG frame It is superior quality, highly-engineered High-Strength Low Alloy Prime Steel frame (HSLA) with controlled properties and Computer Numerically Controlled (CNC) assembly process. It’s the product of BAL RV Group (Elkhart, IN) specially designed for travel trailers and fifth wheels. One-piece seamless fiberglass roof from front profile to rear bumper. Such design, due to no extrusions or seams essentially eliminates water leaks through the roof, back and front cap (areas the most susceptible for leaks when on the road). All that makes Sonic travel trailers robust, low-maintenance and long-lasting RVs designed for comfortable vacations over extended seasons and weather conditions. The model SN220VRB has quite standard layout: front bedroom, central kitchen & living space and rear bathroom. The bedroom can be configured with queen-size bed (standard feature) or optionally with the Murphy-style Sofa/bed. 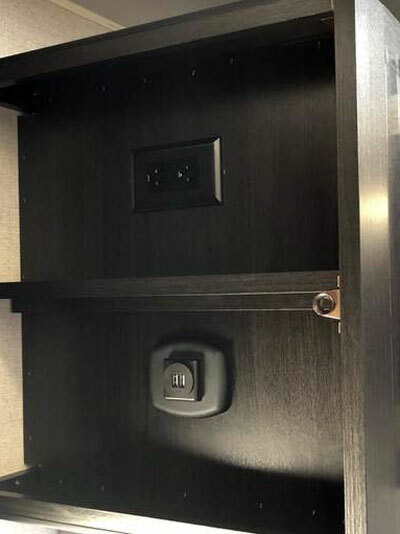 While the latter solution requires some “extra morning & night actions” (folding/unfolding), for a day it offers a decent lounge area with sofa, two nigh tables for books, magazines and drinks as well as power and USB receptacles. Two windows on both sides and nearby entrance door make the area bright (evenings you can count on LED lights), while the overall finish including designer valances adds the pleasant appearance. The foam mattress is certainly not the residential one you will dream off, but it’s the “beauty” of the Murphy bed (actually it can be upgraded as one of options). Easily accessible overhead storage, two tall, side hanging cabinets and large underbed storage proves the practicality of the design. 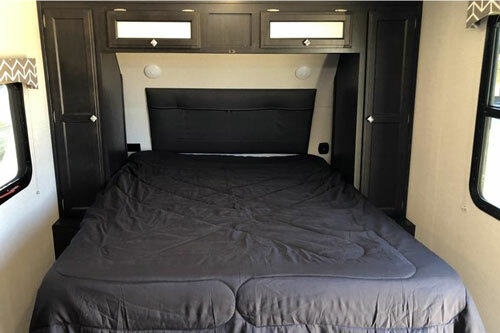 Finally, if needed, you can have some sort of privacy thanks to the curtain separating the sleeping space from the rest of the trailer. The galley with its angled sink cabinet offers a well-equipped cooking environment. 2-burners cooktop with glass cover may have some limitations, but large two-door 7 cubic feet fridge, hood w/vent and lights, optional microwave, ample space in cabinets (standing and overhead ones) as well as impressive pantry make this area not only practical but also quite inviting. 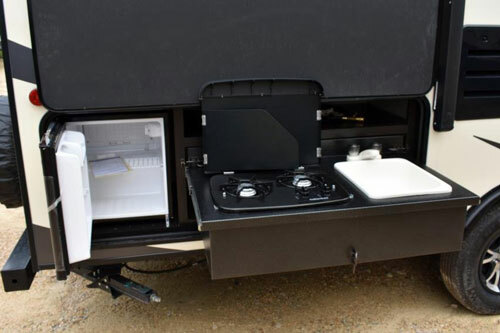 The U-shaped dinette, thanks to its slide-out location is comfortably large, at the same time the central area of the trailer is left free making RV-er’s lives easier. 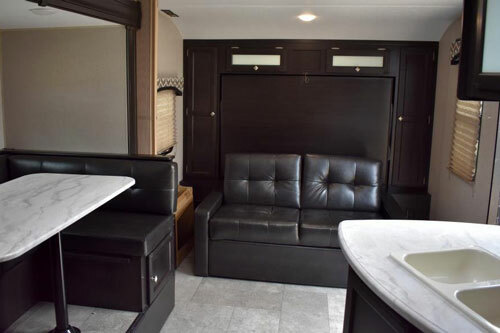 Note tufted cushions (elegance and practicality) and the under-benches storages providing extra room for “stuff”. Needless to mention, that if needed, the large dinette easily converts into equally large, dual-size bed. While for the raison of privacy, it is usually considered as the sleeping space for kids, in practice, thanks to its dimensions (88” x 48”) it can also comfortably serve adults. The large window next to the dinette, smaller (but very useful) in the galley and central skylight make the Cooking/Eating/Living space bright and visually spacious. 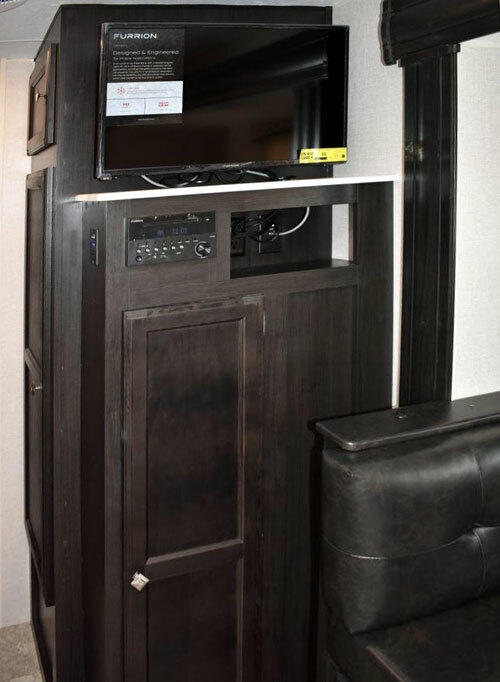 The Entertainment Center is located next to the dinette. Only full AM/FM/CD/DVD/Stereo w/Bluetooth and 2 interior and 2 exterior speakers comes as the standard feature. However, the LED TV and swing-arm come with bracket as an (easy to install) option. Walk-in Bathroom is impressively large and frankly, offers familiar residential characteristics. Large (34”) radius shower cabin with sliding doors and skylight, vanity with sink and medicine cabinet and porcelain toilet – all are easily accessible without any evident space restrains. And as the bonus – you will find the large linen cabinet with sliding mirror doors. 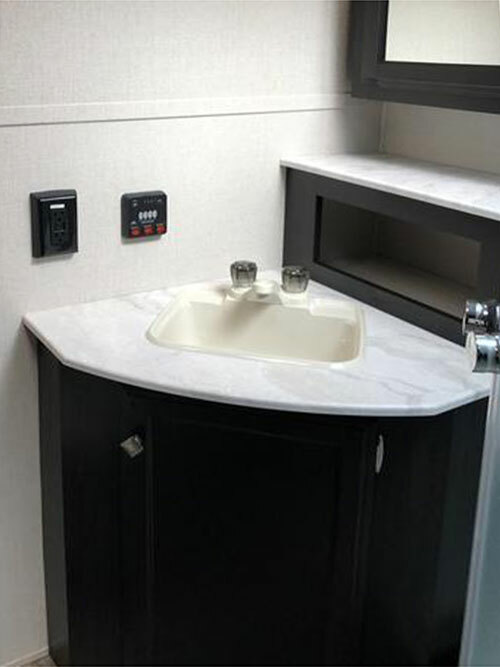 Frankly, such bathroom stands out among competitive designs available on the market for this category of RVs. But the best is waiting outside. And this is a small (but extremely practical) slide-out cooking center. The 2-burner cooktop, single bowl stainless-still sink with hot/cold water and small fridge are more than enough to enjoy preparation of light meals in nature. And if this is not enough, you can also install an optional grill. Available LP quick-connect and coming with grill swing-arm makes it a practical, and easy to use solution. And let’s face it – there is nothing Much Better than the freshly grilled steak in the middle of the Mother Nature (if this is what you selected for your stay instead of the crowded campground). The protective 13ft wide awning “umbrella” guarantees the comfort in most weather conditions (well, let’s exclude from this strong, arctic wind and snow). 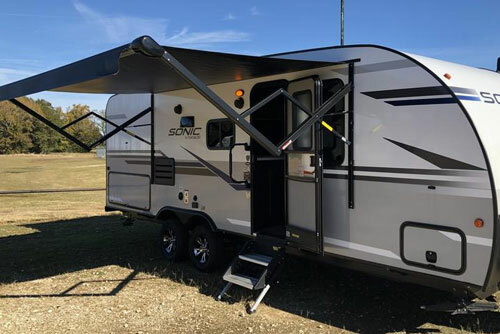 The large pass-through storage at the front allows for packing the camping gear, while magnetic-latch doors and motion activated lights guarantee an easy access 24/7. The LevelMatePRO (optional). It’s an electronic device that calculates and displays info helping to perfectly level the camper (it may not be that easy to use with manual stabilizers, but still, it is a clear help simplifying otherwise time-consuming process). On the negative note: it seems that too many essential interior/exterior features are not part of the standard (or mandatory) equipment. While it is easy to negotiate options when buying the RV, it’s still a bit confusing and misleading approach. The main reason is that Sonic travel trailers are designed as ultra-lite units with defined UVW, and strict GVWR and cargo limits. The latter - anyhow not very impressive (only 740 lbs) will be quickly “eaten” by extra features of which some are truly indispensable. Also, it is not clear from company-provided info if the exterior kitchen (clearly an important asset) is included in standard equipment….